Steel is simply iron with carbon added. Without the carbon, iron is too "soft" and brittle to make a good knife blade. The discovery of adding carbon to iron to make steel quickly replaced cast and wrought iron as steel is far superior in most applications. In simplest terms, carbon is what makes steel hard. The more carbon content, the harder the steel, up to a point anyway. Too much carbon content will make the steel too brittle for use as a blade steel. Modern steel alloys also contain a number of other elements, each bringing a specific property to the steel. Steels with at least 13% chromium is considered stainless steel. I prefer modern stainless steel alloys for most of my my knives. I will make a knife with pretty much whatever steel a customer prefers, but my personal choices are almost always stainless. One common misconception that I frequently hear is that people think stainless steels contain less carbon that the traditional "carbon" steels like O1, 52100, 1095, or 5160. The fact is that the most popular stainless blade steels are high carbon steels and actually contain MORE carbon than those traditional "carbon" steels. 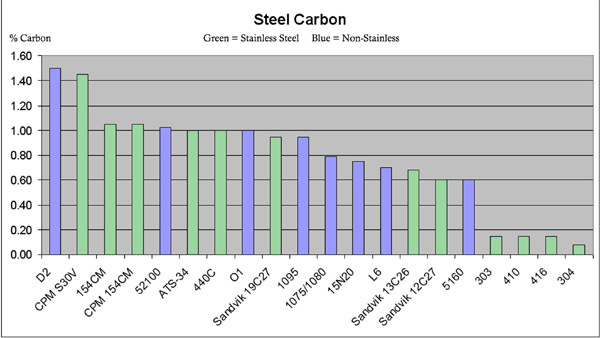 As you can see, of the more common good high carbon cutlery steels, most are stainless. Only O1 and 52100 have as much carbon as some of the most popular stainless steels like 440C and ATS-34 and none contain as much carbon as 154CM. D2 tool steel is the exception but with 12% chromium it is almost stainless. In addition to carbon and chromium, modern stainless steel alloys also contain other elements like Manganese, Vanadium, and Molybdenum. Each of these bring their own properties into the mix to had strength and wear resistance. (See Blade Steel). So if you want high carbon for hardness and wear resistance, why not use a good stainless and get the added benefit of low maintenance? 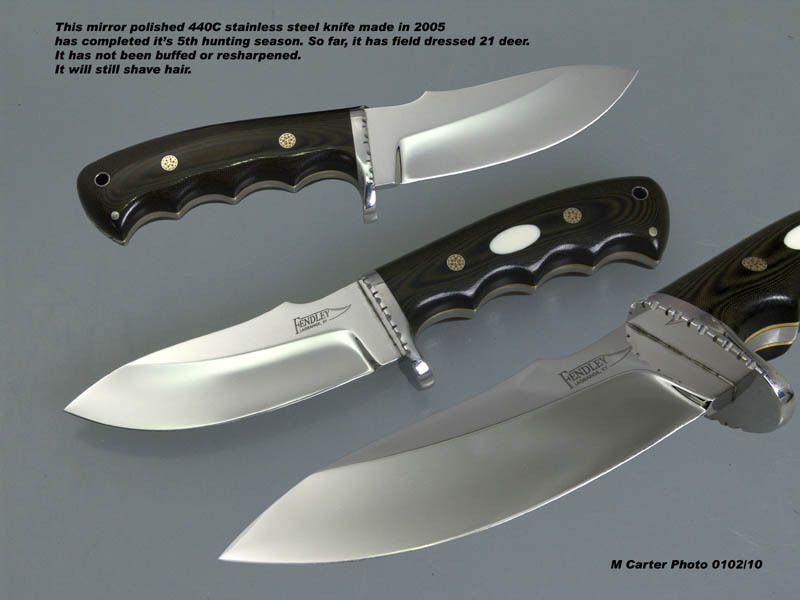 I know that part of the misconceptions about stainless steel comes from the low-carbon and lower quality stainless steels such as 440A, 440B or 420 used by many of the factory production knives. Not all stainless is the same and there are vast differences in how different stainless steels will perform as a cutlery steel depending on their composition. Those low carbon stainless steels aren't really bad but they will not hold an edge like the better stainless steels. Also, always remember that poor heat treatment can ruin even good steel. Another "high carbon" misconception involves railroad spikes. Nearly every bladesmith has made knives from railroad spikes. Railroad spikes are readily available, usually for free, they are a novel item, and they can make a perfectly useable knife. However, they simply do not contain enough carbon to make a good blade. One big misunderstanding comes from railroad spikes that are marked "HC" for "High Carbon". The problem is that what the railroads consider "High Carbon" is equivalent to what a knifemaker would call low carbon mild steel. According to specifications set forth by American Railway Engineering Association there are two classes of railroad spikes, low carbon track spikes used on straight sections of railroads and high carbon steel track spikes used on curves and switches. According to the specifications, low carbon spikes may contain no more than 0.12% carbon and "High Carbon" spikes may contain NO MORE THAN 0.30% carbon. Knife blade steels typically contain between 0.85% and 1.5% carbon, or 3-5 times as much carbon as a "High Carbon" railroad spike. The reasoning is that the railroads want mild steel that will bend rather than break. A bent spike will still hold a rail whereas a broken spike will not. A lot of people believe this one, mostly at the urging of those who forge blades. I take nothing away from bladesmiths who hand forge their blades. Forging is a time honored tradition and it take s a lot of skill to do it well. I admire those who have those skills. But does it make a superior blade? No. Forging - Where the metal is heated to a point where it is malleable and then hammered into the shape you want. Stock Removal - Where a bar of steel is ground to shape. Stamping - Use by most mass produced knives where blades are stamped out of a sheet of steel with a harder steel die. For custom knifemakers, only forging and stock removal apply. When you get down to it, all steel is forged. When I buy bars of steel (bar stock) from the foundry or distributor, it has been forged. It was forged when it was manufactured by rolling and pressing it into shape when it was red hot. Forging is really nothing more than shaping the steel regardless of whether it was done with a hammer, presses or rollers. In the past, most knifemakers HAD to forge their steel because mostly what they had to work with was round bars or salvaged materials like automotive springs or saw blades. Once good bar stock became available, many knifemakers found it much more efficient and got just as good results using the stock removal method rather than swinging a hammer and working hot steel all day. Forging is often popular with beginning knifemakers because there is a lot of readily available and often free raw material available to work with. Old automotive springs, plow shares, saw blades and old files are commonly used to forge a knife blade. And they make some fine knives in some cases. But you are usually dealing with metal of unknown composition and without that, you are guessing at the proper heat treatment which is critical for a good blade. Others forge for the nostalgia of it and to continue the tradition of old world crafts. There are lots of myths about forging. Some claim that beating the steel realigns the grain of the steel better or that they are "packing the edge". Some will even hold to superstitions like the blade must be hammered with the tip pointing north to instill some mystical magical property in the blade. Any good metallurgist will tell you that it's all nonsense. You can't beat goodness into steel. You can take good steel and ruin it through forging or stock removal. Think about it. NO factory produced knives are made by forging. All factory knives are made by stock removal. Sure, stock removal is a more efficient production method but if the forged blade was really superior don't you thing somebody would be doing it in the production world? In the end, one style of making a knife is not inherently better than the other. Stock removal does waste more material as it is ground away into dust but that is balanced by the time and energy saved from not having to repeatedly reheat and pound the steel into shape. Excellent, or bad, knives can be made either way. Here is another one I hear a lot at knife shows. "I would be afraid to use it and scratch it up". Some say a mirror polished blade is too pretty to use. Nonsense! A good mirror polish will hold up much better than most people think. Yes, with use, you will get shallow scratches on the blade but so what? It will still provide the advantages described above and still look better than you might imagine. 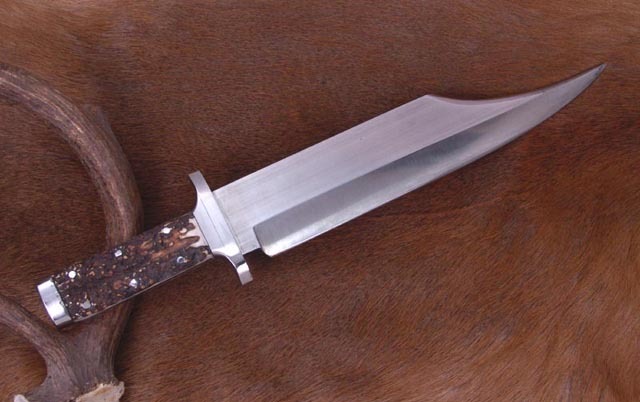 A good example is the hunting knife made by friend Cliff Fendley from 440C stainless. I use Cliff's example because this happens to be one of the most used and carefully documented mirror polished 440C knives I know of. Yes, this is exactly how Cliff's knife looks after field dressing 21 deer over the last 5 years. It has not been re-polished since it was made in 2005. Nor has it been re-sharpened. Cliff just hits it with a few strokes on a croc stick to dress the edge when needed and it will still shave hair. If you look at this knife closely at the right angle in the right light you will see some scuffs and scratches, "memories" as Cliff calls them. 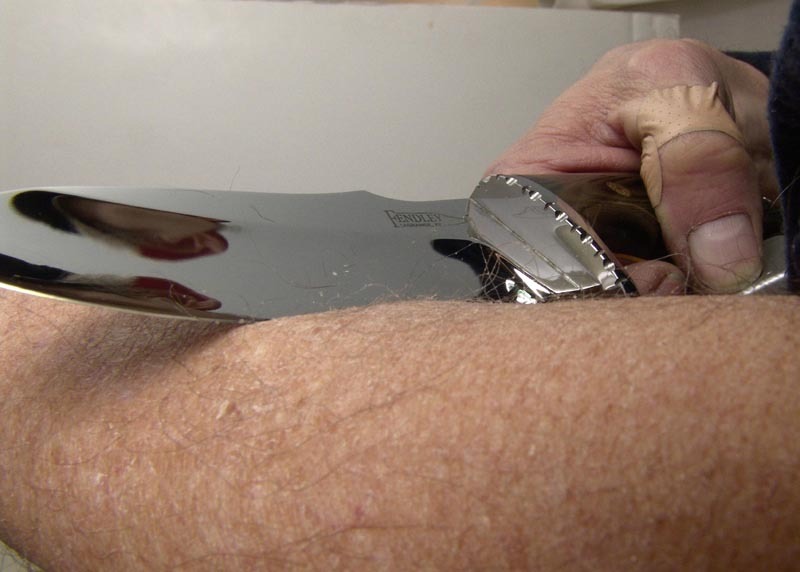 In a survival situation, a mirror polished blade can even serve as a signal mirror. Another added benefit. There are a lot of myths and misunderstandings about Damascus steel. Damascus gets it's name from the region where it is believed to have originated, Damascus Syria. In ancient times, bladesmiths did not have steel alloys to work with. Especially in longer blades like swords, they recognized the need for the metal to be hard to hold an edge yet flexible to prevent breaking. One way they accomplished this was by combining harder and softer metals. The original way it was made, known as "wootz", has been lost and remains a mystery although the are is much speculation about how it was done. Today, what is commonly referred to as Damascus is really forge welded steel. Layers of different types of metal are forge welded together and then usually folded several times to achieve more layers. The resulting steel is then acid etched to show the layers as the acid (usually something like ferric chloride) attacks the different types of steel in different ways. Some layers will turn darker than others when acid etched so the pattern shows up. Some believe that Damascus makes a superior blade. Not necessarily so. In fact, I believe that most modern steel alloys will outperform nearly any Damascus. You have to understand the "Damascus" has become a very general term for layered steel. The Damascus you buy might be very good or very bad depending on the materials used and the skill of the person who forged it. It does take a lot of knowledge and experience to forge good Damascus. It is also a very long, hard and rather expensive process. Good Damascus made from good materials tends to be pretty expensive because of the expense of the raw materials and the amount of work that goes into it. There is a lot of cheap crappy Damascus being imported from places like India and Pakistan these days. Most of this stuff is junk made from cheap scrap metal. It has the Damascus look since it is layered metal but don't expect any performance. There is also steel that has been etched with a pattern to look like Damascus but really has no layers at all. These 13 layers of 4 types of steel are forge welded and then folded 5 times to achieve 416 layers. The nickel content gives it a beautiful bright pattern but nickel is one of the non-hardening steels that is used mostly for looks. The result is much the same as what the ancient bladesmiths were trying to achieve, layers of harder and softer steels that combine hardness with flexibility. I buy the Damascus in large billets as shown below and then cut it and grind to shape and then harden and temper it to make my knives. After grinding, the steel is acid etched to bring out the unique patterns of the many layers of steel. Various types of patterns can be created in the steel by using special dies when forging it or by twisting the billets. No knife in history has gained as much notoriety or has been the source of more myths and speculation than the Bowie knife. The modern Bowie is my favorite style of knife but what we call a Bowie knife today bears little resemblance to the original. The Bowie knife came to fame through a bloody fight in Louisiana in 1827 which became known as the "sandbar fight". Colonel James Bowie (1796-1836) was a famous soldier, land speculator, slave trader, gambler and, some say, a con man. James (or Jim) was in a fight in 1826 where a sheriff named Norris Wright fired at James at point blank range but the bullet was deflected and James survived the encounter. After the fight, James' brother, Rezin Bowie, gave James a large knife for protection in the event he would ever find himself in a similar situation. Understand that in those days people carried single shot pistols that were very unreliable and prone to misfires. The revolver did not become widely available until after 1836. On September 19, 1827, James was involved in the famous Sandbar Fight near Natchez. There was a duel between Samuel Levi Wells III and Dr. Thomas Maddox. Both men fired at each other and both shots missed. They reloaded and fired again. Again they both missed. They decided that their honor had been satisfied. They shook hands and began to leave when others who were present began to argue and fight. Alexander Crain shot Samuel Cuny and then James fired at Crain but missed. Jim Bowie's old nemeses from the previous year, Norris Wright, shot Bowie in the chest and James drew his knife and chased after Wright. The Blanchard brothers shot Bowie in the leg and when James fell, Wright and Alfred Blanchard stabbed him several times with sword canes and knives. Laying on the ground with a sword sticking in his chest, James plunged his knife into Wright's chest killing him and then slashed Blanchard severely. All the witnesses remembered Bowie's "big butcher knife". Even though Bowie had been shot twice and stabbed several times, he recovered and went on to a number of ventures before dying along with 187 other defenders during the fall of the Alamo in San Antonio, Texas on March 6, 1836. The famous fight was reported in newspapers around the country and the legend of Jim Bowie and his Bowie knife was born. People everywhere wanted a Bowie knife and countless versions of various sizes and styles were made by countless cutlers and blacksmiths. Word of the famous knife spread to England and cutlery companies in Sheffield were quick to supply the sought after Bowie knives. Thousands were made and sent to the United States. Nobody really knows for sure what the original Bowie knife looked like but it is pretty certain that what has become known as the Bowie knife today bears little resemblance to the original. The famous knife has been redesigned over the years and was popularized again in 1952 in the Hollywood movie "The Iron Mistress". There have been numerous books, movies and TV shows about James Bowie and his famous namesake knife. Today almost any knife with a blade more than a few inches long and a clip point is often called a Bowie knife. Many believe the original Bowie knife was made by an Arkansas blacksmith name James Black but this has never been authenticated and it has largely been debunked as a manufactured legend. James Black was a silversmith who moved from Pennsylvania to Arkansas sometime AFTER the first bowies were made. The first claim for him having made a bowie knife was published in 1841, 14 years after the sandbar fight. One knife in particular which has become known as "Bowie No. 1" is claimed to have been made by Black. However, other experts believe this knife was made in Ohio in the mid 1800s. Black supposedly did not mark his knives with a makers mark and no known knives today can be definitely traced to James Black. The original Bowie knife was actually designed and commissioned to be made by James Bowie's older brother Rezin Bowie and given to James so that he would never again be caught unarmed. In a letter written by Rezin in 1838 he wrote “The first Bowie knife was made by myself in the parish of Avoyelles, in this state (Louisiana), as a hunting knife, for which purpose, exclusively, it was used for many years”. Rezin went on to describe the knife; "The length of the blade was nine and one-quarters inches, its width one and one-half inches, single edged and not curved". The is very different from the modern Bowie knives seen today but does sound like the knife witnesses of the sandbar fight described as "a large butcher knife". In a recently discovered letter written in 1885, Rezin's granddaughter, Mrs. Eugene Soniat, wrote “This instrument, which was never intended for ought but a hunting knife, was made of an old file in the plantation blacksmith shop of my grandfather’s Bayou Boeuf plantation, the maker was a hired white man named Jesse Clift [sic], he afterwards went to Texas. My mother, Mrs. Jos. H. Moore, then a little girl, went to the shop with her father, heard his directions, and saw Clift make the knife. Jesse Clifft was a blacksmith living on Bayou Boeuf in Louisiana and was a close friend and neighbor of the Bowies in the 1820s. On April 10, 1827 James Bowie went to Marksville, LA to conduct a business transaction with William Hargrove. A document defining the transaction was written by Herzehian Dunham, the Notary Public in and for the parish of Avoyelles, and was signed by the principals and by witnesses Jesse Clifft and Caiaphas K. Ham. This document serves as further proof that Clifft and Rezin were together at the right place and at the right time. The knife that Clifft made to Rezin's specifications was later given to James Bowie by Rezin and was very likely the knife that James used in the sandbar fight six months later near Natchez, Mississippi on September 19, 1827. In the months and years following the sandbar fight, newspapers and novels far and wide regaled the story of the now famous sandbar fight and the legend of Jim Bowie and the Bowie knife were born. It has been said that Jim Bowie did not seek publicity or celebrity but Rezin relished it and basked in the spotlight of his famous brother. As Rezin traveled around the country he had more "Bowie" knives made by various craftsmen. He sometimes presented these knives to friends as special gifts. It is known that Daniel Searles of Baton Rouge LA, Rees Fitzpatrick of MS, and Henry Schively Jr of Philadelphia made knives for Rezin Bowie. Some were inscribed presentation knives with fancy silver fittings and others were plain. Some of these knives have been authenticated and are in collections today. It is likely that Rezin had others made, maybe by someone in nearly every town he visited at any length. Each maker would have imparted his own style and interpretation to the knife and perhaps Rezin even refined the design himself. The "Bowie" knife could actually be several different knives by different makers. One of the knives made by Searles was claimed to have been given to Edwin Forrest, a nationally famous actor of the time. Forrest claimed that is was given to him by Jim Bowie and claimed it to be the very knife used at the sandbar fight. There are no markings or inscriptions on the knife and it was not known until many years after James and Rezins deaths so so there is some doubt about the authenticity of the knife. Its blade is twelve inches long with a very slight clip point. It is noticeable that the Forrest Bowie, as with the Fitzpatrick, Schively and other authenticated Bowies of the period, had no cross guard or clip point as we see in modern "Bowies". It is not known when or where these features first appeared but it is likely that they were additions made by the Sheffield knives imported in the 1830s-1840s. The knives used in the movies and TV shows of the 1950s popularized the modern style of Bowie we usually see today. Whatever the true facts were and whatever the original knife looked like, the Bowie knife has become a part of American folklore and is one of the most famous knives of all time. Untold numbers of Bowie knives have been made and sold over the last 180 years. Nearly every knifemaker has made one and most collectors of fixed blade knives have at least one in their collection. For that reason, the Bowie knife deserves his spot in knife history as one of the most famous and often copied knives in the world.